"TJFOREVER" is committed to providing customers with the Best Products. And all the TJFOREVER Service Members will Try Our Best to Provide You The Best Service. Wireless & wired quick charge 2.0 technology will quickly and effectively help to solve the low power problem for your devices when traveling out. With a free hook,you can hang it on backpack or tent to charge via sunlight at outdoor. Suitable for a wide range of occasions like travel, road trips, hiking, camping, parties, BBQ and outdoor activities. -Long press the ON/OFF button to turn on the LED flashlight. -Press the button again switch flashlight between 3 modes(steady-SOS-strobe). -Press ON/OFF button again to turn off the LED light. 1. Please put it under STRONG sunlight, do not charge it in cloudy day or the place through glass(eg: a window or car). 3. Due to solar charging effect will be subject to sunlight intensity and local weather., it maybe take long time to get full charged if only charged by sunlight(about 20 hours under full sunlight),but there are only 5-6rs direct sunlight per day,so it is recommended to charge by wall charger,which only takes about several hours. 4. This solar charger is waterproof, but please don't immerse it in water. 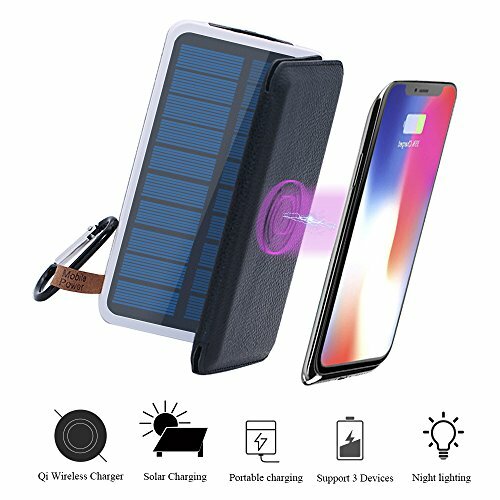 ★3 in 1 Unique Design:Qi Wireless Charger Pad，Large-capacity Rechargeable Battery and 3 large solar panels,works as Wireless charging pad or a power bank on the go(with the solar charging function, never worry about out of power).Support charge up to 3 Devices simultaneously. ★Wide Compatiblity: Supports Wireless Charging at up to 1A for iPhone 10/X/8/8Plus,Samsung Galaxy Note5/S6/S6 Edge/S6 Edge+/S7/S7Edge/S8/ Note8,Google Nexus 6,and other Qi-enabled devices. Also with 2 USB ports(Max 2.1A) for other smartphone and electronic device. ★Dual Recharging Technologies:When you're outdoors, 3 solar panels (9.7x 6.1 in opened) can absorb more sun power, shortens the solar charging time.And when you are at home,you can charge it by wall charger,buit-in 2.1A Input(Max), reducing the recharging time up to 40% compared to 1A input of other power bank. ★A Must-Have Backup Emergency Kit for Hurricane Season: Equipped with 3 large solar panels(the greater the solar panels, the more sunlight),folding solar panel design,easy to carry when you go out.And the LED flashlight have three modes(steady light, SOS, strobe),it will be very useful when you're outside. ★Quailty & Satisfaction Guarantee:Certified by Qi,FCC,CE and ROHS for quality and safety.Support over-current protection,over-temperature protection and over-voltage protection.Perfect battery pack for everyday use,travel,camping or hiking, emergencies, commuters and families. If you have any questions about this product by TJFOREVER, contact us by completing and submitting the form below. If you are looking for a specif part number, please include it with your message.